Installing and maintaining theMB662U3-2S requires no extra tools, as everything you will need is included. The ICYRaid uses our convenient tray-less design to simply make any install a seamless transition to getting your configuration started. Once you have your hard drives ready, simply open each door, slide in your hard drives, and select the RAID setting you like. After that, turning on the device will automatically start the RAID process on its own. If a failure of a drive occurs, easy to read front LED indicators will indicate when a drive is ejected, accessed, or has failed. The ICYRaid MB662U3-2S adds two convenient features, LED and power control. The front LED indicators can be disabled when needed. This is perfect for people who set the enclosure in their bedroom and prefer turn the LED off at night. The second feature is the power saving mode that follows your systems behavior. When your system is powered off or put to sleep, the ICYRaid will activate its sleep mode to conserve power. Both these functions can be changed via dip switches on the rear panel. Taking advantage of the new ultra quick USB 3.0 interface, users will be able to transfer at high speeds at a maximum of 5 Gbps. The USB 3.0 interface is also backwards compatible with USB 2.0, so using the MB662U3-2S on your legacy PC or Mac is not a problem. If the system supports USB 3.0, you will be able to take advantage of the superior performance capabilities – which is crucial for professionals who want tools that perform their jobs quickly and efficiently. It is known that the most common causes of disk failure are poor heat management and mechanical agitation. Taking this into consideration, the build of the MB662U3-2S uses solid aluminum body construction, adding heat dissipation, strength, and protection of your hard drives. The ICYRaid MB662U3-2S in addition reduces external vibrations from reaching the sensitive hard disks by enclosing the drive within a vibration reducing cage, minimizing the possibility of disk damage. Protecting your data also requires that it is constantly maintained to perform at its best. Because hard drives are susceptible to heat failure, it is important to have an active cooling solution. 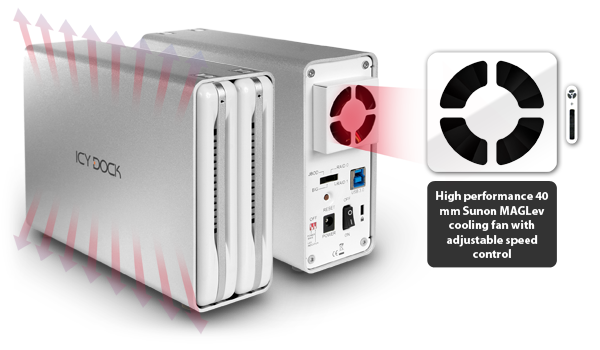 Using the ultra-quiet Sunon MagLev 40mm fan with variable fan speed control ensures optimal heat dissipation or quiet operation for a range of applications such as a recording studio or production room. * Supports 2 x 3.5” SATA I / II / III hard drives for maximum storage. 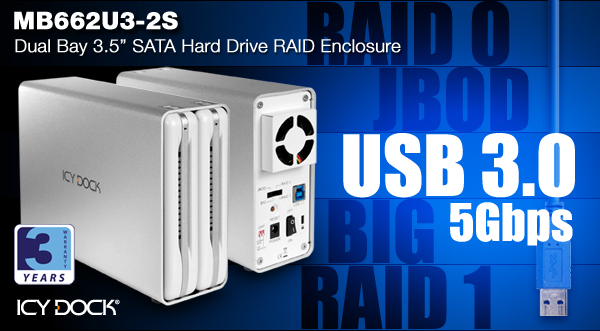 * Supports 4TB in each slot for all 4 RAID modes for up to 8TB of storage. * Front LED indicator light to monitor disk function in RAID. * Designed for media users in any professional field. * Power saver mode that follows your systems behavior to conserve power. * The front LED can be disabled when needed. 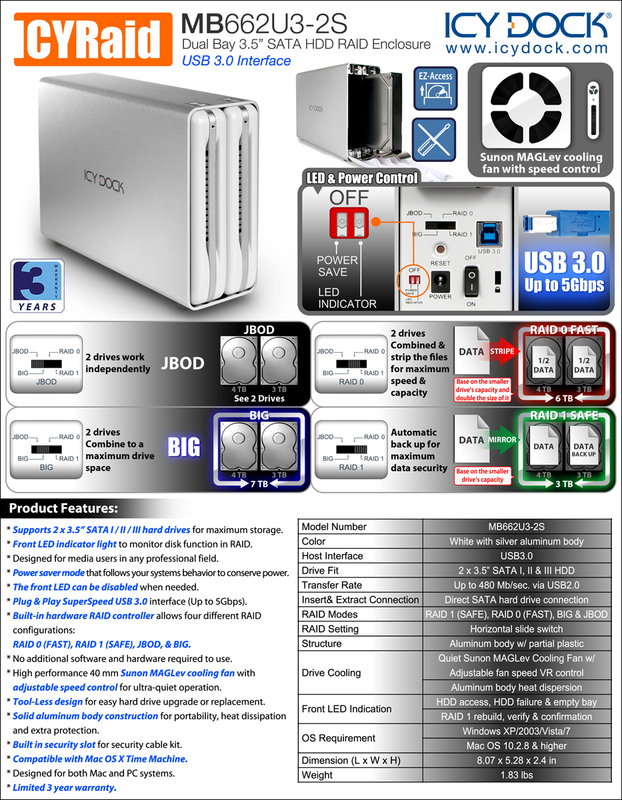 * Plug & Play SuperSpeed USB 3.0 interface (Up to 5Gbps). RAID 0 (FAST), RAID 1 (SAFE), JBOD, & BIG. * No additional software and hardware required to use. * Tool-Less design for easy hard drive upgrade or replacement. * Solid aluminum body construction for portability, heat dissipation and extra protection. * Compatible with Mac OS X Time Machine. * Designed for both Mac and PC systems. * Limited 3 year warranty to complement the typical warranty of a hard drive.